This Niagara Falls New York Motel is within 3 blocks of the major attractions and entertainment in Western New York including Seneca Niagara Casino, The American Falls, Maid of the Mist & Cave of the Winds. The hotel features wonderful amenities such as on site dining from Kohinoor Fine Indian Cuisine Restaurant, Braille Elevators, Cable Television, Handicapped Rooms and Facilities, Fax Machine Guest Use, Limited Free Parking and Air Conditioning. The best value for accommodations, amenities, and offerings are avilable at The Econo Lodge at the Falls Motel in Niagara Falls, USA. Conveniently located in the entertainment district in downtown, and ideally located within walking distance from the mighty Niagara Falls. Enjoy complimentary Wi-Fi Internet Access available in every room for the business traveler. A variety of restaurants and cocktail lounges are conveniently located in the surrounding Niagara Falls USA area. Kohinoor, a fine Indian cuisine restaurant, is located on the property of the Econo Lodge at the Falls Motel. End the long day full of activities in the public Jacuzzi and Sauna. 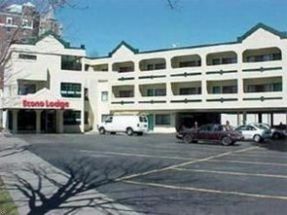 This wonderful Niagara Falls New York motel offers Standard and Deluxe Double Bed Rooms, King Bed Rooms, Jacuzzi Rooms. The Econo Lodge at the Falls feature amenities such as Direct TV, Wi-Fi, microwave and fridges.